Look what we are making this weekend for our preschool friends. 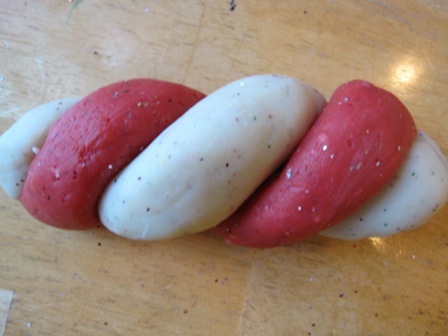 It is not your regular red and white Playdough, but a festive peppermint glitter infused variety. Artful Parent shows you how to make this fun do together for you and the kiddos. She dresses up canning jars and then adds a cute tag ready to share with your little friends. The glitter and peppermint scent really says Merry Christmas. Back in September we made pumpkin latte playdoh that smelled good enough to eat. Take a look at Sweet Sugar Belle’s recipe for gingerbread playdoh and how adorable her packaging is, complete with a Gingerbread Man cookie cutter! Click on Secret Sale to see 50% OFF Melissa & Doug toys for all good little girls & boys!